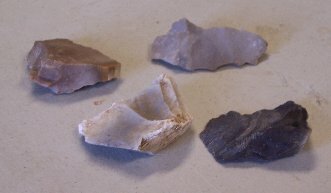 Phoenix Obsidian Designs is attempting to provide supplies for Primitive Technological Projects. Below are some of the Geological and Other items currently available. We are hoping to increase the number and quality of these items over the next year with the expansion of our Primitive Craft Store. Other similar items are available through the Natural Gift Pages.  If you are looking for some specific supply please directly CONTACT US or use this Special Request Form (pdf) to obtain a quote. This bag contains a screened amount of shiny obsidian flake/grit. Choose by approximate size - 1/16 inch, 1/8 inch, or 1/4 inch. These flakes are perfect for decorating items or for use as a sanding grit. Comes measured by the ounce. 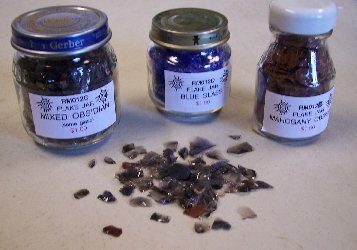 Jars full of either obsidian or glass small flakes. These jars can be used themselves for decoration or the flakes they can contain are perfect for decorating items. 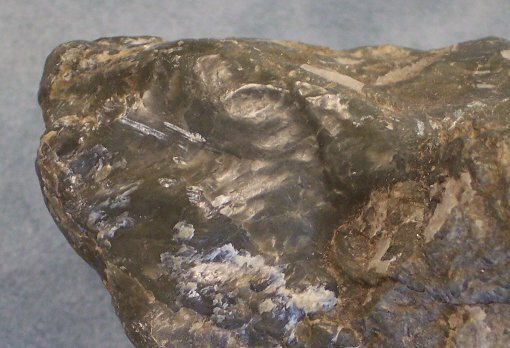 An irregular small chunk of soapstone (steatite). This metamorphic rock has a high talc content which gives it a greasy luster. It is usually white or grey but can also come in shades ranging from pink, green and blue. It is one of the softest rocks and is often soft enough to carve even with a finger nail. The particular hue, softness and size of the piece sent is not guaranteed. 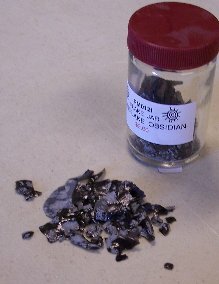 The source of this soaptone is in the vicinity of Grass Valley, California. 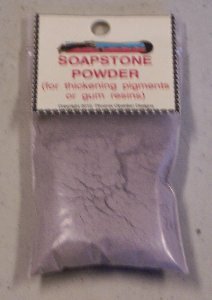 A small bag of powdered soapstone. Used in pine pitch adhesive as well as in various pigments as a thickner. 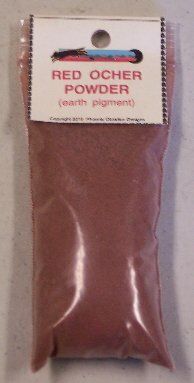 A small bag of powdered ocher ready to be used for a reddish pigment. The source of this powder is from Pit River, California. A large bag, one pound, of alum ready to be used in tanning leather. 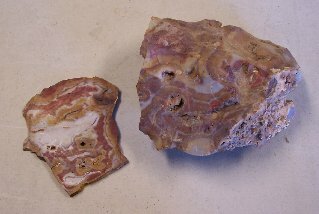 An irregular small chunk of jasper. This cryptocrystalline silicate rock varies in color from an opaque lustrous red to a brown or yellow. It often has much variation in the hue and saturation of these colors across the material. It is said to stimulate a dynamic and lively energy that reduces feelings of victimization. An irregular small chunk rainbow chalcedony. This cryptocrystalline silicate rock has a wide range of colors across the surface - hence the name rainbow. Several pieces appear to have an eye produced by the streams of color. These rocks come from the Goldfield, Nevada region. The particular hue and size of the piece sent is not guaranteed. 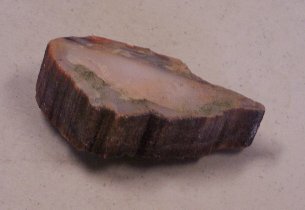 An irregular small chunk of petrified wood. This cryptocrystalline silicate rock which was formed by the replacement of wood by water deposited minerals. 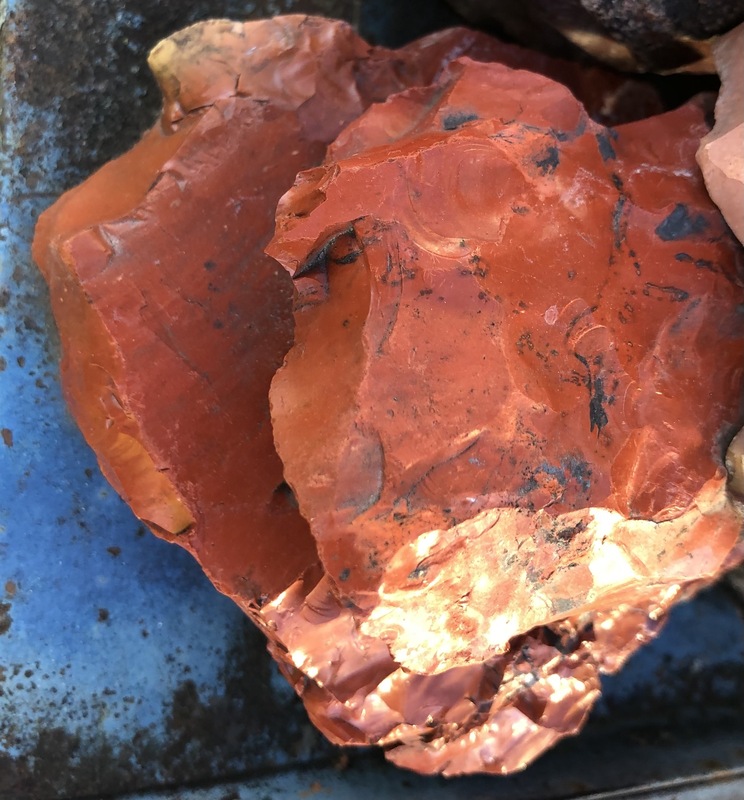 We have either Rainbow Petrified Wood which has a wide variety of bright colors or a Local Petrified Wood which comes in dull white to brown hues. Most pieces show classic wood features like rings or bark. Offered here are large CCS Flakes of a wide variety of size and shape.